Dan Harris opened Breezewood Proving Grounds, or BPG for short, in March of 2002. 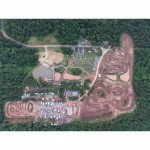 At that time there were three full size motocross tracks, a kid’s track and 7 miles of wood trails. They had a successful first summer but were unfortunately shut down over a law suit brought on by neighbors in November that same year. It took almost three years before Dan could get the park re-opened again in July of 2005, minus one track and the wood’s trail. The park has done well since re-opening and they have been able to make considerable improvements, including the swimming pond with beach area, water slide, high-dive and diving-board, the stage for live music, an announcing tower and a new starting gate with concrete base. They have added the Parts Store, the dining hall, bathrooms and 28 RV hook up sites over the years. Memorial Day 2003 was the first Outlaw Race at the park. There is now a complete six race series that averages 300 racers per event! BPG allows open riding 8am to 4pm on race day, then racing 4pm until dark. A one moto format, has been extremely popular. It allows riders the opportunity to get plenty of ride time and practice before lining up on the gate for some great racing. In 2008 BPG had their first 5-day, 5-night Dream Camp at the park, where Pro ATV racers Jason Dunkelburger, and 2-time, and then current National ATV Champion Dustin Wimmer taught riders advanced racing techniques. Training with National Pro Racers is such an amazing opportunity, and being able to stay in the cabins and have meals provided makes for an incredible camp. Over the past seven years Dream Camp has grown to having eight National Pros attend as trainers at one time, it’s a truly “Dream Experience” for riders. 2015’s pro line up is current points leader and 2x Pro Class Champion Chad Wienen returning for his 3rd year as a Dream Camp trainer. 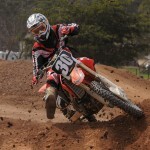 Former 2x Pro Class Champion Dustin Wimmer returns for his 8th consecutive year training at the BPG. John and Michelle Natalie will once again be here, John is first ever Daytona Supercross Winner and former National Champions. Josh Upperman, Thomas Brown, and Nick Moser will all be returning for their second year as trainers. And new for 2015 is Joe Byrd, as the Joe Byrd Training Facility will be sponsoring the camp. Improvements for 2015 include black top for the entire driveway into the park, allowing for a cleaner trip into the park for your truck or RV, less dust, and less erosion and run off. More bleachers and a new spectator area are also planned for the intermediate track and the addition of three permanent trailer/campers for yearly rental. Dan is also working with Engineers to design plans that will allow them to develop riding trails at the park. This is a long slow process and they do not expect to have approvals before 2016. As always the park will continue to improve and get better. The Proving Grounds always welcome ideas and suggestions on ways to make improvements. The park is open 5 days a week from 8am to 8pm, closed only on Tuesday and Wednesday.